A fricassee is basically a stewed dish. 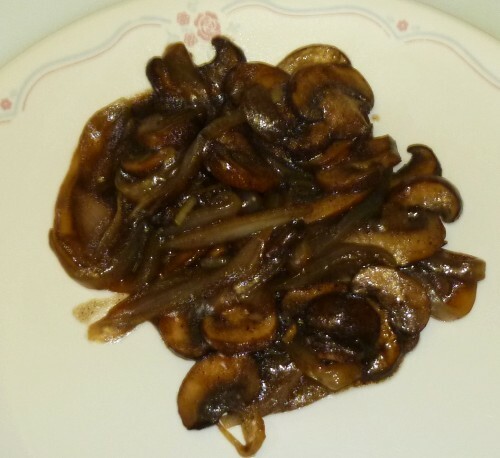 This recipe can be made with wild mushrooms or with cultivated varieties such as cremini or button mushrooms. It can be served as a hearty side dish to accompany a meal, or it can be served over polenta or pasta as a main dish. Heat the oil and the butter. Fry the onion and garlic until translucent. Add the mushroom slices, the bouillon cubes and the balsamic vinegar. Stir frequently. The mushrooms will give a lot of water. When most of the water has evaporated, add the starch well mixed with one tablespoon of cold water. The starch will thicken the fricassee. Taste the dish and add salt and pepper as desired.